After a strong challenge in 1982, Ed Pimm stayed in the Super Vee series for 1983 with Jim Trueman's Red Roof Inns team. 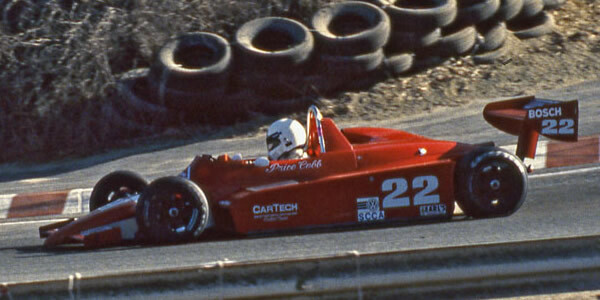 Trueman joined Pimm in a second car for 1983, making the FSV operation effectively the junior arm of the Truesports CART team. Trueman and Pimm started the season in a pair of Anson SA4s, the latest verson of the car in which Peter Moodie had taken a surprise win at Road America the previous year. Pimm won in Milwaukee in the Anson but the car was clearly not as quick as Price Cobb's Ralt RT5/83, so in August Pimm moved into a pair of new Ralts. His move coincided with misfortune for championship leader Cobb, the Texan who had returned to full-time racing after two years on the sidelines. He lost his sponsor mid-season and was forced to sell his backup car and complete the season on a shoestring. Pimm won four races in succession in his Ralt through August and September and when Cobb retired at Riverside, the championship was virtually over. Cobb won at Laguna Seca, when the engine in Pimm's Ralt wouldn't start and he had to race Trueman's Anson, but the points gap was still too great for Cobb to overhaul in the final race and Pimm was crowned champion. Other drivers to enhance their reputations Roger Penske Jr who took over the seat in the Frank Arciero team from 1982 champion Michael Andretti and Chip Robinson in the Bill Scott Racing entry. Englishman Eddie Jones was badly injured in a crash while driving for Anson importer Bertil Skollenskog at Pocono. Of the 11 races in 1983, eight were supporting races for the booming CART Indycar series and with the demise of the long-standing CASC Formula Atlantic series and the exodus of most of Can-Am's talent straight into CART, FSV was now the main ladder series below CART. Of the 1983 cohort, only Pimm moved straight into CART, securing a drive in Jet Engineering's March 83C. For more on this season, see Gordon Kirby's seasonal survey in Autosport 15 Dec 1983 p42. The results here have been compiled by Chris Townsend using US magazines such as SportsCar and On Track. Some results are still incomplete and entry lists are also needed in some cases. Ralt chassis records allow a lot of the RT5s to be identified but it was rare for US race reports to mention former owners of second-hand cars, unlike the regular habit of European reporters. Other identifications have been gleaned from SCCA logbooks for the cars that have survived.